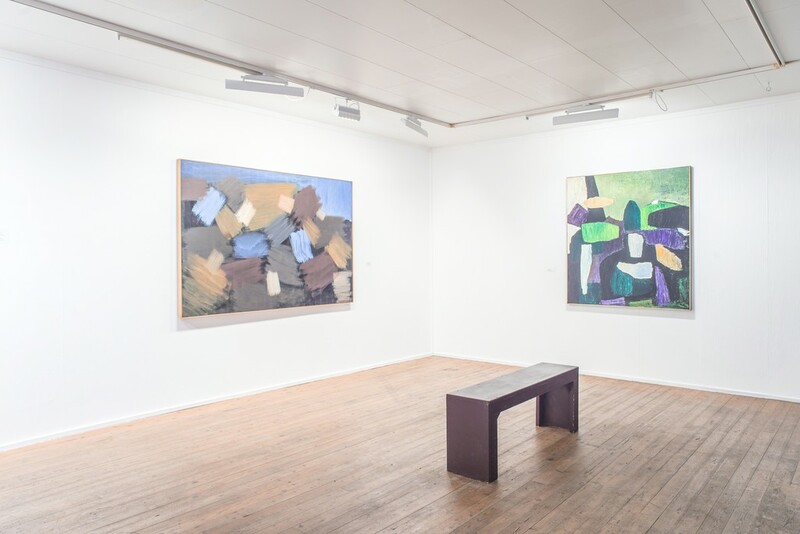 An exhibition of two modernist painters from Seyðisfjörður, Iceland Nína Tryggvadóttir (1913-1968), who was born in the town, and Gunnlaugur Scheving (1904-1972) who grew up there. Landscape and nature has always been an inspiration for artists. Icelandic artists Nína Tryggvadóttir (1913-1968) and Gunnlaugur Scheving (1904-1972) are no exception from that tradition. 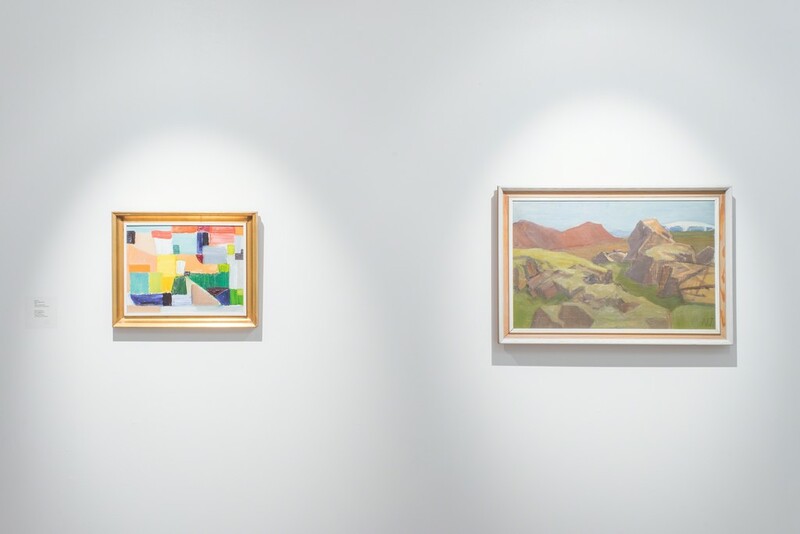 Even though their key works in this exhibition, Síldarbátur (e. Herringboat) by Gunnlaugur and Eyðimörk (e. Desert) by Nína, are not conventional landscape paintings they do present a kind of a conclusion of these two artists’ development and experiments through the years. Nína finally established the artistic freedom to work and develop her own style while studying at the Royal Danish Academy in Copenhagen. From the late 30’s Nína painted many portraits of which are considered within the dominant tradition of the time, but still with a hint of cubism influence. In the late 50’s she mainly painted urban landscapes but in the following years she started to move her motifs from city life out to the nature. 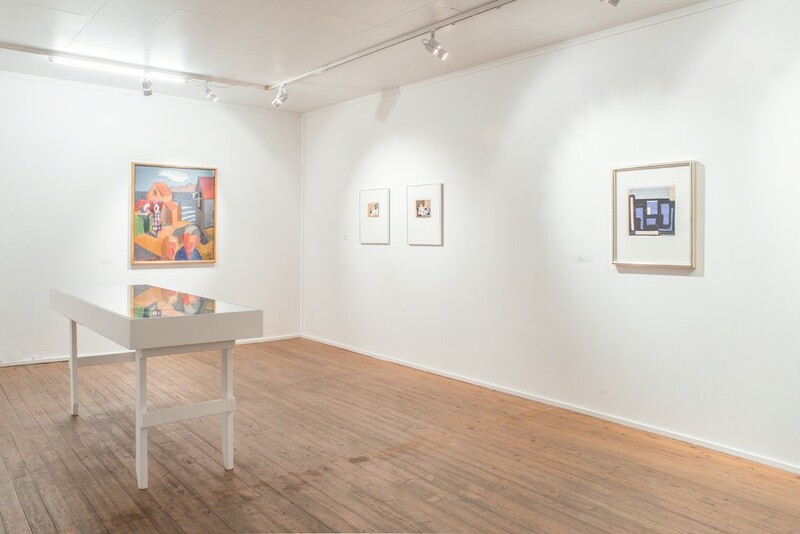 In the following years she continued to develop her style and during the second half of the 20th century she stopped using figurative motives and her work became more abstract which lead to her collages. Today these works are the ones she is most well known for. At a young age, Gunnlaugur started to draw with pencil. Everything around him in his hometown, Seydisfjordur, caught his eye and ended up on a piece of paper. He mostly illustrated people going about their daily lives and throughout his career he continued to feature common people. He also made traditional landscape paintings that were more experimental in discovering himself as an artist. His earliest works consisted of the aforementioned pencil drawings but from them his style developed to strong, straight diagonal lines dividing the canvas. The horizon and background become less relevant and even disappear into the lines and the perspective becomes tighter. Gunnlaugur turns more towards expressionism and cubism with simple structure by putting the focus on geometrical forms. The painting Síldarbátur (e. Herringboat) clearly shows this influence. Nína and Gunnlaugur belong to a generation of Icelandic artists who started their careers when traditional landscape was dominating the art scene in Iceland. Many other artists and critics disapproved of those moving away from traditional motifs and methods, it was even considered as a sort of degeneration of the art form. But times were changing worldwide and a new generation of artists were able to move against the tide, which lead from very homogenous to a more diverse interpretation and all of the sudden one could experience all kinds of landscape. Collaborators: the National Gallery of Iceland, Landsbankinn, Reykjavík Art Museum and Arion Bank. Supported by List fyrir alla and the Regional Development Fund of East Iceland.